Ontario’s public service workers will soon be working with Web technology that is slightly less obsolete with an upgrade from Internet Explorer 6 to Internet Explorer 8. The thought that anyone is still using a browser that will celebrate its 11th anniversary on Aug. 27 is astounding. 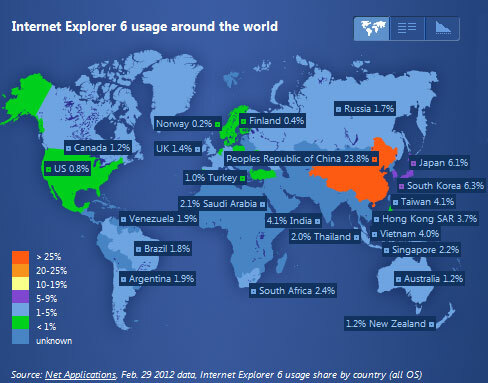 But according to Microsoft, 7.1 per cent of the world’s Web browsing population is still using this software artifact. The Redmond-based software giant is encouraging its users to upgrade, with a goal of seeing worldwide usage drop below one per cent. In Canada, usage is currently pegged at 1.2 per cent. The pain for Web developers who still feel pressure to support IE6 is even worse. One of the more obvious gaps of support is IE6’s inability to display transparent PNG images. Users simply see a grey background instead. But developers won’t exactly be popping the champagne in celebration of this latest upgrade victory. IE8 has its quirks too. It calculates the spacing of elements on a Web page differently than any other browser. To properly centre an image for IE8 users, Web coders must write a separate piece of code instructing on margin padding and border sizes in addition to the code they’ve already written for other browsers. By moving to IE8 instead of IE9, the Ontario government will miss out on convenient features like a unified search and URL address bar, or an add-on manager. But most significantly, they’ll miss out on the HTML5 features of natively embedded video, audio, and interactive graphics that Microsoft supports in IE9, and competing browsers like Firefox and Chrome also support. HTML5 is fast becoming the go-to Web standard for modern pages because of its flexibility of design – one page can be optimally displayed on a desktop monitor, smartphone screen, or tablet. Likely the Ontario government can’t migrate to IE9 because it is also using a decade-old OS in Windows XP. That would also mean the clock is already ticking on a bigger upgrade project, migrating to Windows 7. Microsoft will cut support for XP in April 2014, and unless the government is willing to risk using an unpatched OS across its environment, it will have to upgrade. That will also mean an inevitable move to IE9. Of course, two years from now the rest of us will probably be using augmented reality goggles and brain-computer interfaces to browse the Web.